Fixing Wholesale Funding to Build a More Stable Financial System. Thank you for having me here to speak today. As you all know from daily experience, the financial system plays an essential role in modern economies. Because financial intermediation is critical to economic activity, disruption to it can cause severe damage to the economy. The experience of recent years revealed serious flaws in the system. Risk was mispriced and there was a build-up of excesses before the crisis. Structural weaknesses in the financial system then amplified the effect of the bursting of the bubble in U.S. house prices, and the result was a widespread financial crisis. One critical factor was the extensive use of short-term wholesale funding in the years leading up to the crisis. Not only did this aspect of our financial system create the potential for a firm to fail in an extraordinarily rapid manner when faced with a loss of market confidence, but it also served as a channel through which the effects of those failures were widely propagated throughout the broader financial system. I will also consider the larger issue of the appropriate role of wholesale funding in the financial system. How comfortable should we be with a system in which critical financial activities continue to be financed with short-term wholesale funding without the safeguards necessary to reduce the risk of runs and the fire sales of assets that can threaten the stability of the entire financial system? As this audience knows, in the two decades before the financial crisis, the global financial system underwent rapid transformation. During this period, there was a shift from bank-based financial intermediation to capital markets-based financial intermediation,2 and an increase in the scale and complexity of securitization activities. In the pre-crisis period the growth of securitization was accompanied by a growing reliance on short-term funds raised in wholesale markets to finance securities and activities essential to securitization. This ranged from the use of repo3 funding to finance inventories of securities held for market-making4 purposes to the issuance of asset-backed commercial paper by conduits5 created to acquire and hold securities. The increased use of short-term wholesale finance was driven both by demand and supply factors. On the demand side, it was more profitable to use shorter-term funds to finance longer-term assets. On the supply side, such funding was plentiful because it was viewed as safe and because of the growing institutionalization of savings with corporations and institutional investors in need of deposit-like products in which to place their cash balances. After all, the funds were only exposed for a short period of time, and in the case of repo, secured by collateral. The growing reliance on short-term wholesale funding to finance longer-term assets increased liquidity and maturity mismatch risk. This was particularly dangerous because many of the assets being financed were structured-credit products, some of which were opaque, difficult to value and illiquid. Short-term funding of longer-term assets is inherently unstable particularly in the presence of information and coordination problems. It can be rational for a provider of funds to supply funds on a short-term basis, reasoning that it can exit if there is any uncertainty over the firm’s continued ability to roll over its funding from other sources. But if the use of short-term funding becomes sufficiently widespread, the firm’s roll-over risk increases. In this situation, there is a strong incentive for each lender to “run” if there is any uncertainty that could undermine the borrower’s ability to continue to roll over its funding from other sources. This is the case even if the provider of funds believes that the borrower would remain solvent as long as it retained access to funding on normal terms. What was new prior to the crisis was the extent to which maturity transformation and financial intermediation began to take place outside of commercial banks. This activity occurred largely without the types of safeguards—robust prudential regulation, deposit insurance, lender of last resort—that have safeguarded the commercial banking system from the types of widespread panics and runs that are capable of destabilizing the entire financial system. The risk created by this gap in coverage was not well recognized by regulators or the private sector. Market participants had little incentive to internalize the negative externality of run-risk created by their collective choice of finance and made erroneous assumptions about the liquidity of asset markets and the capacity and willingness of banks to distribute central bank liquidity to the wider financial system during periods of stress. Because the boom years resulted in strong earnings, low price volatility and few credit losses, firms were able to operate at extreme levels of leverage. When the housing bubble started to deflate, the vulnerabilities of this type of business model soon became apparent. Heavy reliance on short-term wholesale funding exposed the system to a series of intertwined downward spirals in asset and funding markets. This spread in waves, beginning in the market for asset-backed commercial paper (ABCP) issued by off-balance-sheet conduits, and spreading via auction-rate securities, to the repo, money market and financial commercial paper markets that formed the core financing for market-based financial intermediation. Initial declines in asset prices forced leveraged holders with maturity mismatches to sell assets. This increased price volatility and reduced the value of the assets that collateralized other firms’ borrowings. Higher volatility led banks and secured lenders to raise margins, while concern about counterparty risk and their own funding needs made banks reluctant to on-lend liquidity. Higher margins on repo and increased collateral calls due to credit ratings downgrades reduced the quantity of assets that could be financed in repo markets and elsewhere, prompting further asset sales.6 As wholesale investors started to exit, this set in motion a bad dynamic—a fire sale of assets that cut into earnings and capital. This just increased the incentives of investors to run and for banks to hoard liquidity against the risk that they could themselves face a run. This downward spiral of fire sales and funding runs was a key feature of the financial crisis. The fragility of short-term wholesale funding was greatly aggravated by certain critical institutional shortcomings in these markets, particularly in the structure of the tri-party repo system and the U.S. money market mutual fund business. 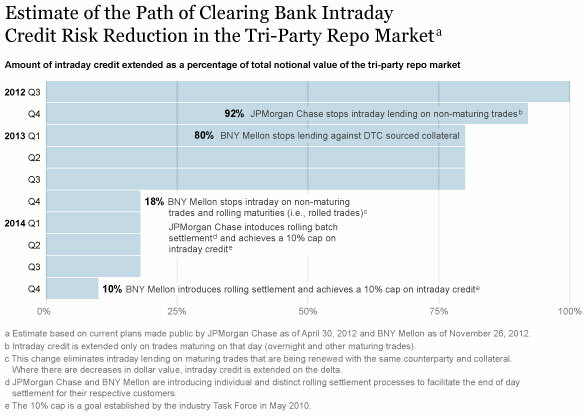 Through the tri-party repo market, the two large clearing banks were providing a large amount of intraday credit to securities firms each day to facilitate the daily “unwind” of the prior day’s transactions.7 In the run-up to the crisis, the daily “unwind” practice helped make tri-party repo look like a very liquid investment while still being an apparently highly durable source of funding. This masked the underlying risks and contributed to weak risk management practices. As the concerns about the U.S. housing market escalated in 2007, participants in the tri-party repo market became increasingly concerned about the liquidity and credit risks that they faced. The clearing banks became uncomfortable with their large intraday exposures to their tri-party securities firm customers. After all, if a securities firm were to fail suddenly, the clearing banks could be stuck with huge loans to these counterparties, secured by securities that were not necessarily high quality and liquid. Thus, as the condition of the most troubled securities firms deteriorated, there was a risk that one morning a clearing bank might decide not to unwind a firm’s tri-party transactions in order to avoid a large intraday exposure. This risk faced by the clearing banks, in turn, unnerved the tri-party repo investors. After all, if the unwind did not occur, they would be stuck with the collateral securing their loans from the night before. Most of these investors were not prepared to take possession of and liquidate such collateral, and had no interest in doing so. The incentives for these investors were to run at the first sign of trouble to avoid getting stuck with the dealer’s collateral. This incentive to run was reinforced by the fact that if the investors were stuck with the collateral, they would have strong incentives to sell it quickly in order to generate the liquidity needed to meet redemption calls or to keep their portfolios in line with regulatory guidelines. Such “fire sales” of assets could result in losses and could be extremely destabilizing to markets. Then, as the crisis intensified, lender of last resort liquidity provision was extended to directly backstop key wholesale funding markets and opened to certain nonbank firms. The Federal Reserve created a direct backstop to the tri-party repo system through the Primary Dealer Credit Facility (PDCF). When the Reserve Fund broke the buck after the failure of Lehman Brothers, precipitating a run on money market mutual funds, the Treasury guaranteed money market fund assets and the Fed introduced the Asset-Backed Commercial Paper Money Market Fund Liquidation Facility (AMLF). The Fed also backstopped the commercial paper market (formerly funded in large part by money market mutual funds) by introducing the Commercial Paper Funding Facility (CPFF). When wholesale funding for non-residential mortgage securitizations evaporated, the Fed rolled out the Term Asset-Backed Lending Facility (TALF). Since the crisis, a number of steps have been taken that reduce the vulnerability of the system to funding runs in short-term wholesale markets. Capital and liquidity requirements for large complex financial institutions have been raised sharply, the largest broker-dealers have become part of bank holding companies subject to additional regulation, and risk-weights on assets have been adjusted to better capture risks and to reduce the scope for regulatory capital arbitrage by banks. Higher capital levels for bank holding companies reduce the incentive for providers of funds to run from these firms at the first sign of trouble. Higher liquidity buffers8 also help so that banks do not have to sell illiquid assets at the first signs of funding difficulties. This reduces the fire sale risk: that the sale of illiquid assets will depress asset values, potentially turning a solvent firm into an insolvent one. A version of this chart is updated periodically. See the latest update. Reducing the market’s dependency on intraday credit will make the market more resilient to future stress events, by forcing all participants to consider the credit and liquidity risks they are exposed to. Meanwhile, in 2010, the Securities Exchange Commission (SEC) tightened the liquidity requirements and concentration limit rules for 2a-7 money market mutual funds and increased the fund manager disclosure requirements. These changes, which were intended as a first step, make money funds somewhat less risky. But, they do little to reduce investors’ incentives to run at the first sign of trouble. Worthwhile as the steps taken thus far are, we have not come close to fixing all the institutional flaws in our wholesale funding markets. The tri-party repo system and the money fund industry that plays a crucial role financing collateral through it are both still exposed to runs. In fact, in each of these areas, one could argue that the risks have increased compared to prior to the crisis. That is because the Dodd-Frank Act raised the hurdle for the Federal Reserve to exercise its Section 13.3 emergency lending authority and because Congress has explicitly precluded the U.S. Treasury from guaranteeing money market mutual fund assets in the future. With extraordinary interventions ruled out or made much more difficult, this may cause investors to be even more skittish in the future. This is why it is essential to make the system more stable. Turning first to the issue of tri-party repo reform, there is still considerable work to do. In particular, the risk that investors will run at the first sign of trouble persists. That is because the costs of running are very low relative to the potential costs of staying put. The potential costs of staying are elevated in part because investors often don’t have the capacity to take possession of the collateral or liquidate the collateral in an orderly way should a large dealer fail. Both aspects result in run risk, fire sale risk and potential financial instability. Let me be clear. We must deal with the fire sale issue in tri-party repo and the heightened run risk it creates. I believe there are three potential ways forward, all of which are superior to the status quo. First, tri-party repo transactions could be restricted to open market operations (OMO) eligible collateral.11 Such collateral would likely remain quite liquid during a time of crisis.12 In addition, such collateral could, in a crisis, potentially be passed directly by a broker-dealer to the discount window under Section 13.13 authority, or, because of beneficial treatment under Section 23A of the Federal Reserve Act, be financed by a banking affiliate that would then itself borrow at the discount window. Thus, one could construct an effective lender of last resort backstop for an OMO-eligible- only tri-party repo system. However, there are also some significant disadvantages to such an approach. The less liquid collateral could just migrate to be financed elsewhere, with associated run and fire sale risks. Also, given that housing finance reform could cause the agency debt and agency mortgage-backed securities (MBS) of Fannie Mae and Freddie Mac to be replaced by something different that was not OMO eligible under the Federal Reserve Act, the share of assets that are OMO eligible could diminish over time. Finally, this approach would do little to mitigate the risk of fire sales of a defaulted dealer’s collateral by its investors once a dealer is bankrupt. The second option is to have a mechanism or process to facilitate the orderly liquidation of a defaulted dealer’s collateral. One could imagine a mechanism that was funded by tri-party repo market participants and potentially backstopped by the central bank. This would have the advantage of dealing with the entire tri-party repo market and not artificially favoring one type of collateral over another. It would also push against the underpricing of liquidity and credit risk during good times by forcing market participants to pay for the costs of a liquidation facility up front. Third, if borrowers and investors did not embrace an orderly collateral liquidation mechanism, supervisory oversight could be brought to bear to limit the use of tri-party repo funding on the grounds that it is still an unstable source of funds. For example, the use of tri-party repo could be restricted unless borrowers demonstrated that there was an adequate means of orderly collateral liquidation upon the failure of a major dealer. Turning next to the issue of money market mutual funds, further reform to directly address the incentive for investors to run is essential for financial stability. 1. Moving to a floating net asset value (NAV). 2. Retaining a stable NAV, but adding a new NAV buffer and a minimum balance requirement. The minimum balance would be at risk for 30 days following withdrawals. If the fund subsequently “broke the buck” during this period by suffering losses greater than the size of its NAV buffer, the minimum balance would be first in line to absorb these losses. 3. A larger NAV buffer than in the second alternative, but without a minimum balance at risk buffer. I have stated my views on money fund reform before.14 Although any of these proposals—depending on the fine print of course—would likely be an improvement over the status quo, the first and third proposals don’t fully eliminate the incentives to run. In the case of a floating rate NAV, fund managers faced with large redemption requests typically sell their most liquid assets first, leaving the remaining investors with a riskier, less-liquid portfolio and a greater risk of loss. Similarly, with a stable NAV and a capital buffer, unless the capital buffer were very large, there would still be an incentive to run because the buffer might not prove large enough to shield the investor from loss. A minimum balance at risk of loss would also increase market discipline. Corporations and other sophisticated investors would have an incentive to monitor risk-taking more carefully, rather than rely on their ability to get out ahead of small retail investors when trouble materializes. The financial crisis clearly demonstrated that we can no longer assume that in periods of stress banks will be willing to access lender of last resort loans and on-lend to the nonbank financial sector at sufficient scale to stabilize the system of market-based financial intermediation, as happened in earlier periods such as the commercial paper crisis in the mid-1970s. The financing needs outside the commercial banks may be too large relative to the capacity of the banking system, banks may be reluctant to lend to competitors, be concerned about their own liquidity and funding needs, or simply be deterred by elevated counterparty risk. We need to consider whether our current architecture is satisfactory. If we were to decide that the existing state of affairs is not acceptable in financial stability terms, there are two broad paths we could follow. The first option would be to take steps to curtail the extent of short-term wholesale finance in the system. In principle, regulators across a broader set of institutions and markets could take steps to directly limit the use of short-term wholesale funding to finance longer-term assets, and take actions that reduced the amount of maturity transformation associated with securitization markets. In other words, regulators could require that a greater proportion of market-based finance be funded by longer-term debt. Alternatively, additional legislation or regulatory changes could be implemented to reduce the volume of wholesale-funded, capital markets activities. It is also true that some of the measures under debate in the area of limiting the scope of activity or the scale of certain financial institutions, three of which were explored by my colleague Federal Reserve Governor Dan Tarullo in a recent speech, would likely have the effect of reducing the use of short-term wholesale funding relative to the current status quo.17 For example, if regulators were to cap the size of a bank’s overall liabilities relative to gross domestic product (GDP) not only would this have the effect of capping the size of individual firms, but it also would likely limit the use of short-term wholesale funding by the largest institutions. The other path would be to expand the range of financial intermediation activity that is directly backstopped by the central bank’s lender of last resort function. This expanded range could be defined either in terms of access by the types of firms that are systemically important in market-based finance, or by types of activity or assets. It is worth pausing here to review in a little more detail the two key functions performed by a lender of last resort. The first function is to provide a precautionary backstop: to reduce the risk of a financial panic beginning in the first place by ensuring that collateral can always be financed.18 The first function is important because it makes it less likely that investors will back away from firms because they think others perceive an elevated risk of insolvency, even if they themselves do not share this view. Thus, a lender of last resort facility can reduce the risk of financial instability due to coordination problems even if the lender of last resort is not utilized.19 In contrast, an emergency facility is unlikely to be as effective. There will be uncertainty around whether it will be deployed, whether it will arrive in time, and how broad it will be. The second function of a lender of last resort is to prevent the fire sale of assets by firms facing a sudden loss of funding from spreading contagion across the system and disrupting the provision of credit to the economy. This is particularly important during a financial panic, when the demand for liquidity increases sharply. Only the central bank has the ability to meet this increased demand under any potential circumstances. We have banking activity—maturity transformation—taking place today outside commercial banks. If we believe these activities provide essential credit intermediation services to the real economy that could not be easily replaced by other forms of intermediation, then the same logic that leads us to backstop commercial banking with a lender of last resort might lead us to backstop the banking activity taking place in the markets in a similar way. However, any expansion of access to a lender of last resort would require legislation and it would be essential to have the right quid pro quo—the commensurate expansion in the scope of prudential oversight. Substantial prudential regulation of entities—such as broker-dealers20 —that might gain access to an expanded lender of last resort would be required to mitigate moral hazard problems. For example, firms might take less care in managing liquidity and capital if they know they have a lender of last resort backstop and be subject to less counterparty and creditor discipline. In addition, the fact that an institution has access to a lender of last resort facility has value to the institution, even if that institution never taps the facility. Thus, without a corresponding imposition of offsetting obligations and costs, the granting of access would create a significant competitive advantage. Extension of discount window-type access to a set of nonbank institutions would therefore have to go hand-in-hand with prudential regulation of these institutions. Many thorny issues would have to be resolved. For example, who would have access and on what terms and conditions? How would foreign-owned broker-dealers be treated? Would an insurance-type payment be appropriate for firms that enjoyed lender of last resort access but did not have insured deposits? How would the Fed’s role, as the lender of last resort, be coordinated with the oversight responsibilities of the primary regulators? Of course, the choice might not be as black and white as this. Some activities undertaken by securities firms or other nonbank entities presumably are much more socially useful than others. In this case, legislators might deem that certain classes of securities firms should be granted access to a lender of last resort facility, but restricted in the scope of their permitted activities to those that do clearly create social value. The sheer size of banking functions undertaken outside commercial banking entities—even now, after the crisis—suggests that this issue must not be ignored. I don’t think we should be comfortable with a situation in which extensive maturity transformation continues to take place without the appropriate safeguards against runs and fire sales. Pretending the problem does not exist, or dealing with it only ex post through emergency facilities cannot be consistent with our financial stability objectives. The issue of the social value created by market-based financial intermediation and appropriate scope and terms associated with a lender of last resort function are complex ones that require further study and analysis. However, regardless of where we come out on these questions, we must make the basic structure of the wholesale funding market as sound as possible. Thus, we must push ahead with tri-party and money fund reform. 1 I note that the set of issues relating to wholesale funding are closely related to the challenge of ending ”too big to fail” I discussed in a November 15, 2012, speech (see www.newyorkfed.org/newsevents/speeches/2012/dud121115.html). The more stable the sources of funding, the more resilient each firm would be, and the less the failure of any one firm would disrupt the provision of credit to the economy. 2 Banking groups retained a prominent role in credit supply via nonbank affiliates outside the commercial bank. 3 A repo is a sale of securities coupled with an agreement to repurchase the securities at a specified price on a later date. 4 Market makers are institutions such as securities brokers and dealers that buy and sell securities on behalf of customers. Market making accommodates the asynchronous arrival of sellers and buyers, thus providing liquidity to financial markets. 5 Conduits are bankruptcy-remote, special purpose vehicles that fund pools of securities in short-term funding markets. The securities might consist of loans, mortgages, receivables and securitized products such as asset-backed securities (ABS). The securities in asset-backed commercial paper (ABCP) conduits serve as collateral for the issuance of asset-backed commercial paper, while repo conduits fund in the repo market. Most conduits are so-called single-seller conduits that only serve individual banks or finance companies. Multi-seller conduits provide funding for asset pools of multiple institutions. Conduits are backed by credit lines from commercial banks, which allow the conduits to have a credit rating. Asset-backed commercial paper conduits are also defined in "Shadow Banking: A Review of the Literature." Federal Reserve Bank of New York Staff Reports, no. 580, (October) 2011. www.newyorkfed.org/research/staff_reports/sr580.pdf. 6 The problem was particularly acute for those firms with large securities trading and over-the-counter derivative businesses operated outside of depository institutions. In the United States, even those securities firms that were part of bank holding companies were vulnerable because Section 23A restrictions in the Federal Reserve Act that govern transactions between the bank and the nonbank affiliates as part of a bank holding company complex sharply limited what assets the securities firm could pass through to the bank and on to the Fed’s discount window facility. 7 In the unwind, cash was transmitted back from securities firms to wholesale investors each morning, to hopefully be reinvested and returned back to the securities firms by the end of the day to finance their inventories of securities. 8 The new global liquidity standards adopted by the Basel Committee provide a global minimum standard. 9 At the end of 2011, the New York Fed disbanded a private-sector taskforce that had generated some good ideas but was running into trouble on implementation, and adopted a supervisory approach to pushing forward further reform. 10 These estimates are based on data from the clearing banks with analysis by New York Fed staff. 11 OMO eligible is collateral that the Fed can purchase or repo in its open market operations. 12 In addition, because the Federal Reserve is authorized to intervene in the Treasury, agency debt, and agency MBS markets, it could act to stabilize these markets during times of stress. This would make it easier to liquidate such collateral without unduly depressing prices. 13Financial Stability Oversight Council. 2012. "Proposed Recommendations Regarding Money Market Mutual Fund Reform." (November). 14 See William C. Dudley. 2012. "For Stability’s Sake, Reform Money Funds." www.bloomberg.com, August 14. http://www.bloomberg.com/news/2012-08-14/for-stability-s-sake-reform-money-funds.html. 16 Although the largest stand-alone securities firms adopted bank holding company status during the crisis, their non-depository institution arms do not have access to the discount window backstop because Section 23A of the Federal Reserve Act restricts the ability of the holding company to transfer assets from the non-depository institution to the commercial bank affiliate that has access to the discount window. 18 A lender of last resort finances with an appropriate haircut. 20 Several of the largest broker-dealers adopted bank holding company status in recent years, but Section 23A rules restrict the capacity of their banking subsidiaries to channel liquidity to their broker-dealer operations.